It is only very rarely that some reader of this blog tips me off about a film that I should review on this site. When it does happen, however, it is always very welcome, and this week’s entry, The Adventures of Tartu is one that I could have easily overlooked, had I not been informed about it. It was back in October, 2013, four years and a half ago, after I had written about another British spy thriller, Q Planes (1939), that the user Alan wrote a message mentioning The Adventures of Tartu. (Alan has his own very nice blog in Spanish, Corriente textual, where he sometimes writes about films at the Internet Archive.) I immediately put it on my list of films to see, but it took until quite recently before I got around to it. The Adventures of Tartu is a propaganda spy thriller. 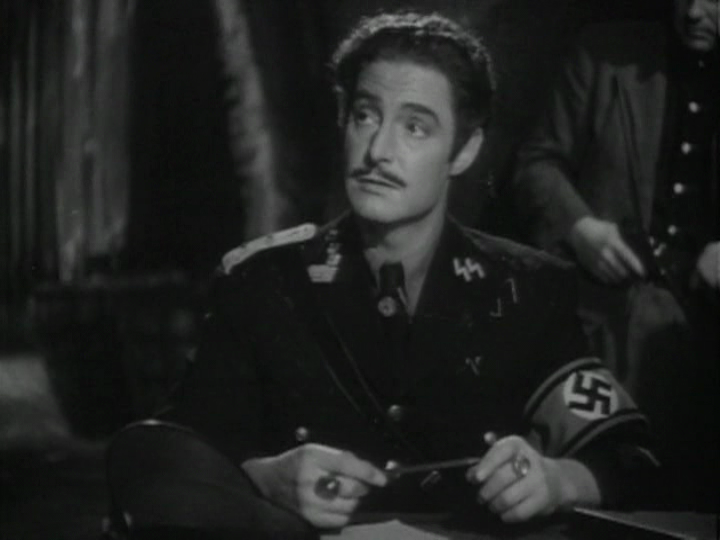 Robert Donat plays a chemical engineer in the British Army who bravely defuses unexploded bombs during the London Blitz. Because of his skills as an engineer, and his considerable knowledge of language, he is recruited for an undercover mission behind enemy lines. The Nazis are about to start production of a new type of chemical weapon, so the formula must be stolen and the chemical plant in Czechoslovakia, where the weapon is manufactured, must be destroyed. Can one man accomplish this? Our hero may have a chance, under the guise of the Romanian fascist Jan Tartu. It is obvious that The Adventures of Tartu was cheaply made. Yet another war-time propaganda, cranked out to keep morale high. But even so, it has considerable qualities. For example, I am highly enamoured with the futuristic settings of the chemical plant. 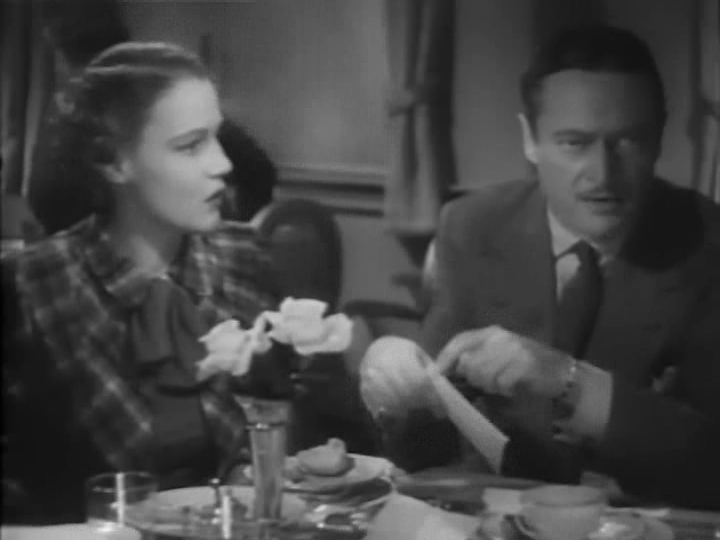 Robert Donat and Valerie Hobson also work well as the romantic couple. This film is best enjoyed for its fast-moving and intricate plot, complete with several sudden and unexpected twists. The story sometimes stretches the edges of credibility, but it is so much fun watching it that such trivialities matter little. Plenty of good old movies at the Internet Archive are practically forgotten today. Many deserve to be so, but others are better than their non-existing reputation would suggest. Murder in the Clouds is such a film. 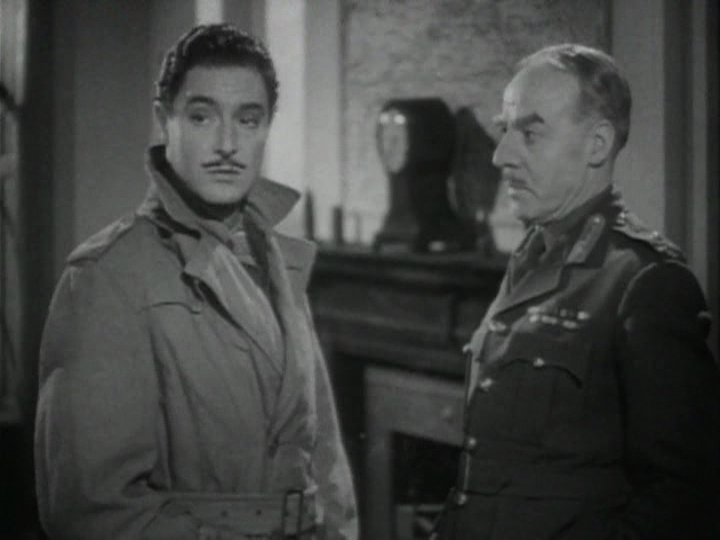 Murder in the Clouds has a somewhat convoluted and improbable plot, yet not without a certain charm. Our hero is the hot-shot pilot “Three Star” (Lyle Talbot). He has been grounded for reckless flying, but gets another chance when an extremely important flight must be made, delivering a secret explosive device which can change the nature of warfare (someone invented the atom bomb that early?). 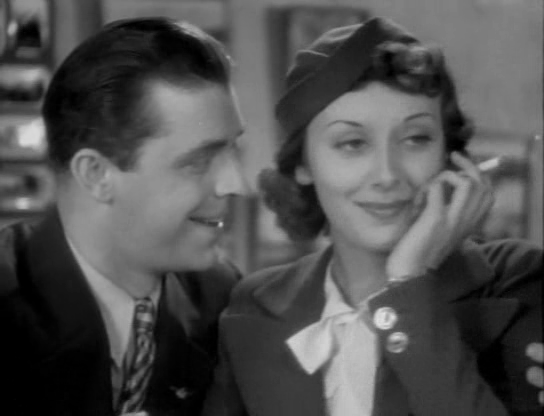 “Three Star” is also in love with Judy (Ann Dvorak), whose brother is to be his co-pilot on the important flight. But of course, things happen; further entaglements involve friends who may not be who they seem, a mountain cabin and a fateful bar fight. 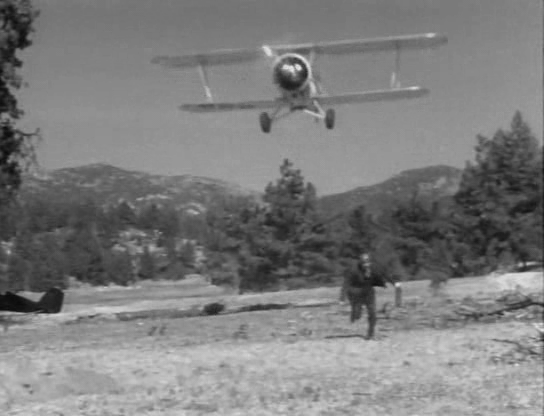 Compared with similar aviation B movies, such as Danger Flight (1939) or Q Planes (1939), Murder in the Clouds has much better flight sequences. There is a pretty ugly mid-air explosion, but otherwise the aerial scenes are both varied, elegant and well filmed. They were mostly shot at and around Grand Central Airport outside Glendale, California. The airport is long since gone, but the runway has been converted into Grand Central Avenue and some of the buildings also exist. Ann Dvorak is mostly remembered today for her role two years earlier in the classic original version of Scarface. 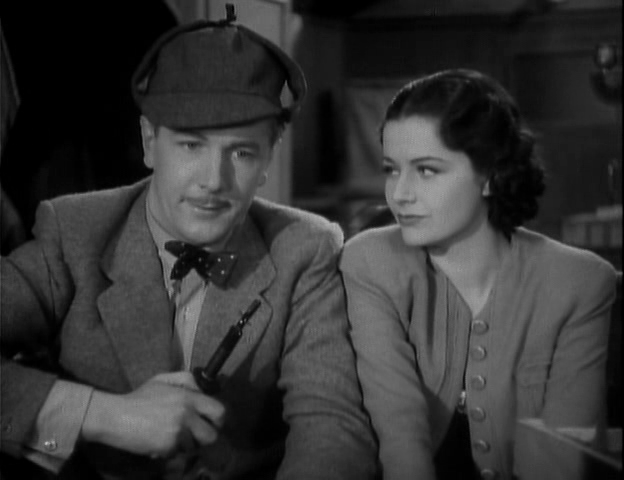 She was a good actress, and even though her initial shots in Murder in the Clouds are a bit too tightly strung, she improves as the movie rolls along, and is excellent for the most part. This film is best enjoyed for the high quality aerial stunts. Carnival. Nice, France. Fireworks. Drinks, costumes and wild dancing. And in the middle of it all, the American John Harwood. 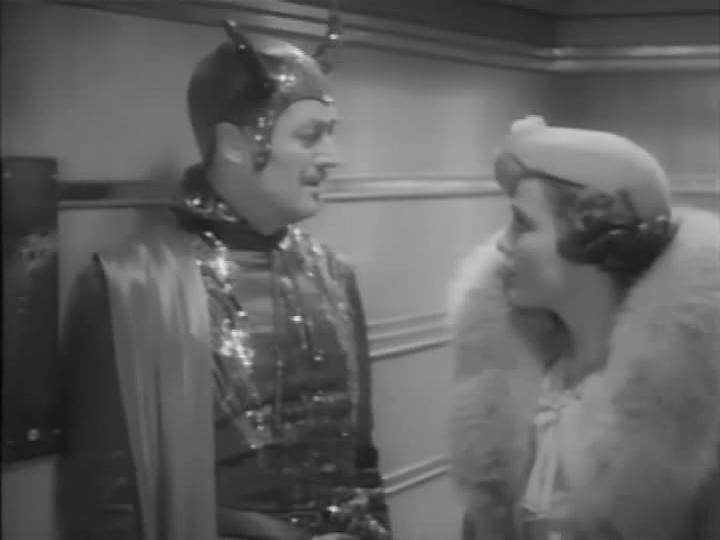 Dressed as a devil and somewhat drunk, Harwood stumbles upon a dead man when accidentally entering the wrong hotel room. But when he manages to convince others to come to the scene, the body is gone. Who died? And why? The plot thickens with a train crash that just may have been sabotage and the disappearance of a woman that Harwood met. 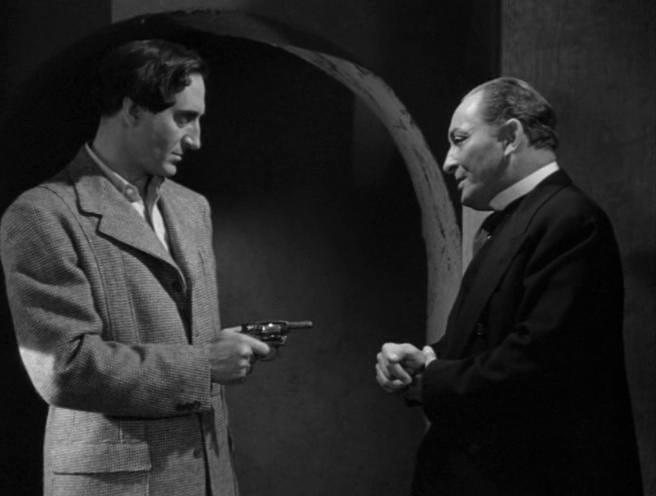 The film thus described is Seven Sinners (released as Doomed Cargo in the US), a very nice mystery thriller. 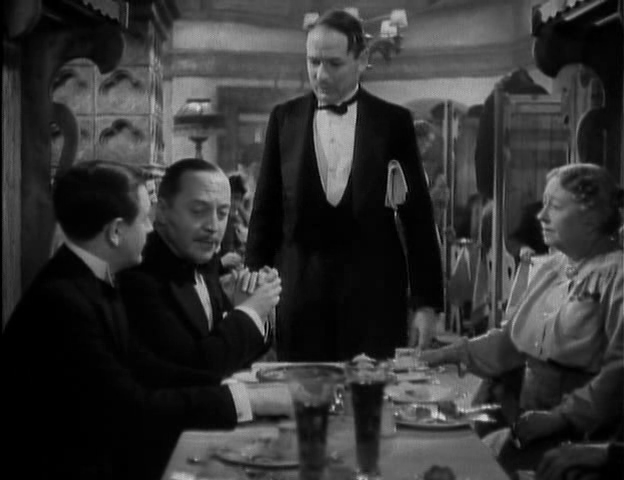 In many ways, this film reminds of Alfred Hitchcock‘s English films from the 1930s (many of which are also available at the Internet Archive, e.g. 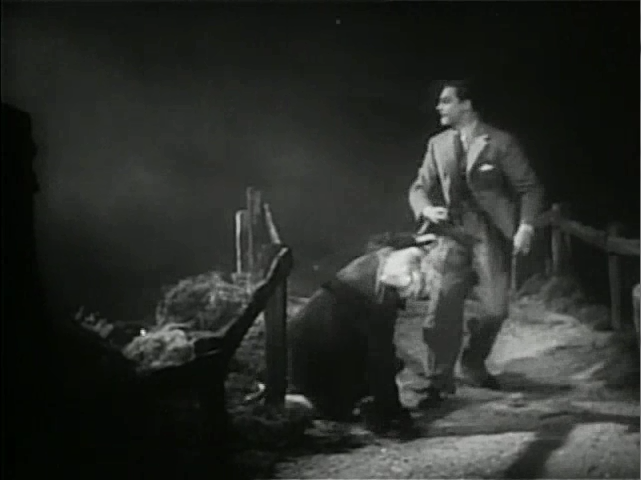 Secret Agent (1936), which also has a train crash as an important part of the plot). Though competently made, Seven Sinners does not have the edge in composition and editing that Hitchcock does. 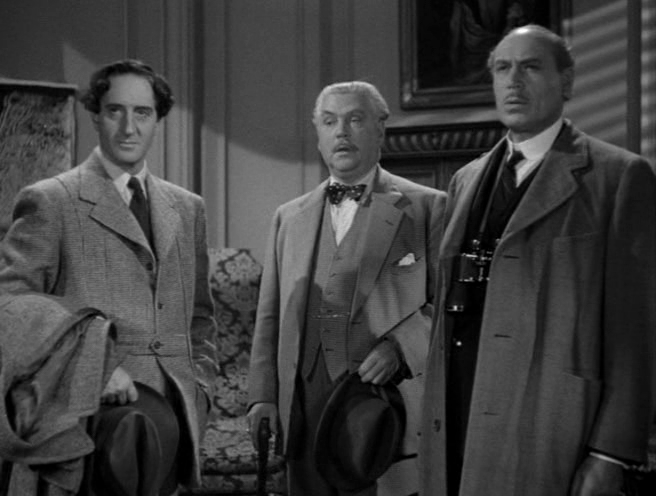 The story and acting, however, are quite up to Hitchcock’s standards, so if you enjoy Hitchcock’s British films, there is a good chance that you will enjoy this one as well. There is another film titled Seven Sinners (1940) with Marlene Dietrich and John Wayne. I have not seen that one, but it too is rumoured to be good. It is avaiable at the Internet Archive, but that copy appears to be dubbed in German, so no good unless you speak that language. This film is best enjoyed if you love mysteries. This one is better than most. The story goes something like this: Superman, who had debuted a few years earlier published by National Allied Publications (later DC Comics), had become a major success, and the publisher was now eager to create an animated series with the character. They approached the Fleischer brothers, who headed one of the most successful animation studios at the time. The Fleischers, however, were not interested in doing action animation (they had mostly done comedy, such as Betty Boop and Popeye). But instead of declining the offer, they gave a ridiculous bid to make the series for $100,000 per episode. Even though this was negotiated down to half, they could not decline such a lavish offer, and so the Superman animated series was born. A pilot and eight subsequent episodes were produced by Fleischer Studios. Then Fleischer was reorganised as Famous Studios, who went on to produce eight more, for a total of seventeen. The Fleischer episodes are generally better and focuses more on science fiction, whereas those from famous contain much more war propaganda. All are worth seeing, though. 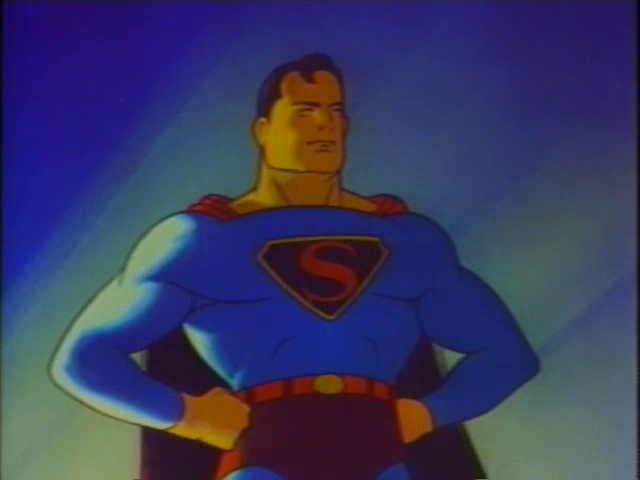 The series is the origin of many of the iconic characteristics of Superman. For example, it features the first ever costume change in a phone booth (along with many other inventive changes of costume); also, this is where Superman learned to fly (before, he could only jump very high); and even though it had been used before, I am guessing that this series is the reason why the “It’s a bird … (etc)” cry became famous. It is not entirely coincidental that this series started the same year as the Adventures of Captain Marvel serial. 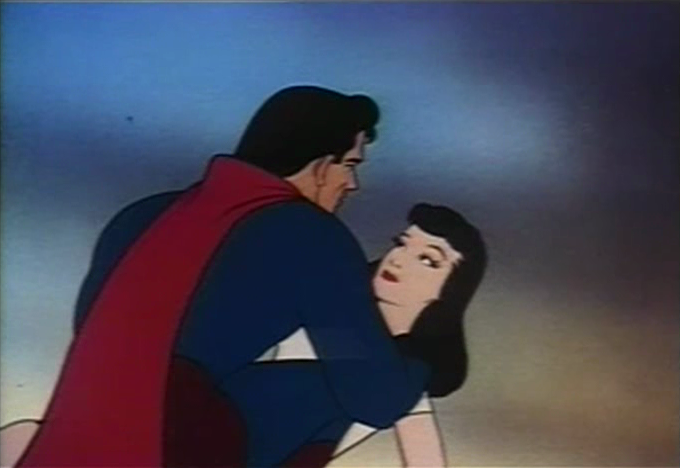 Even though the Superman series is not a serial, it is clearly inspired by the same serial tradition, and the two superheroes were fierce competitors in the comic stands at the time. 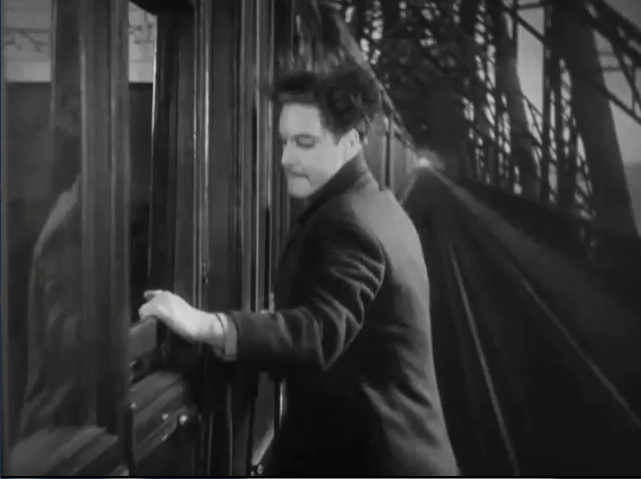 One Internet Archive user has combined all the episodes into one feature film version. I have not seen that version myself, so cannot say if the image quality and resolution are good enough. This series is best enjoyed for its playfulness and its splendid, mood-setting images. It is true that, even in spite of the enormous budget, the animation is sometimes short of perfection and the stories are far from logical. Yet, every episode of Superman is packed with fun and action.